This information will be used by teachers who don’t use the SchoolLoop Gradebook but need to submit grades through SchoolLoop. Note: Grades can be submitted as many times as needed until the submission window closes. Note that each submission overwrites the previous. 1. Go to Grades Due to access Submit Grades page. 2. 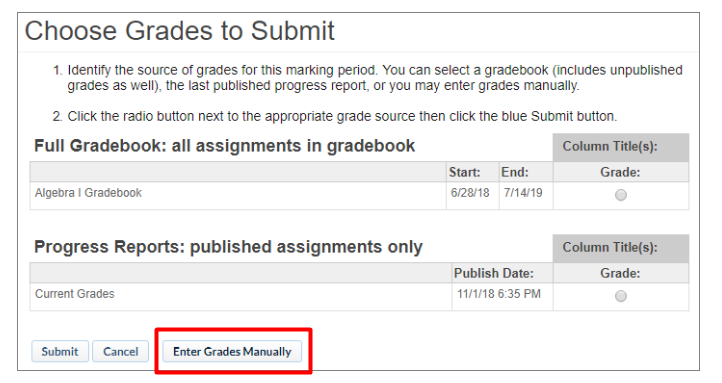 Click the Enter Grades Manually button. When grades have been successfully submitted they become available for review in the Gradebook.